Yes, another one of Mom’s! I can’t help it, they’re good and worth sharing! This simple, aromatic, warming, creamy stew is quick, nutritious, and filling. It’s great with brown rice, but can also be had with some wholegrain bread, dosas or appam, or even on it’s own when you’re feeling like having a light meal. 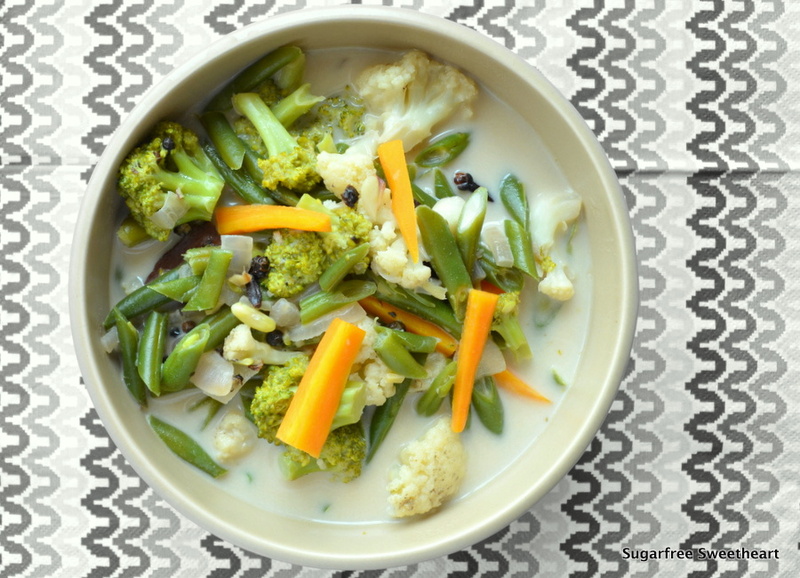 Combine the goodness of lightly cooked vegetables of your choice, aromatic spices, especially pepper, with ginger, chillies and coconut milk to make this stew. Mom usually puts potatoes in this stew, but since we were going to have this with rice, I decided to omit the extra simple carb of the potato and instead I put a teaspoon of brown rice flour to thicken the stew – something that’s usually the job of the potatoes. This recipe is suitable for diabetics, weight watchers, and cold days that need some peppery stew-ness! Use any kind of veggies you like. Mushrooms and baby corns would be great, I think! Add sautéed or grilled tofu or paneer to increase the protein quotient. Adjust the quantities of water and coconut milk to get the consistency and creaminess to your taste. Think healthy, cook healthy, and send in your recipes. To see what other bloggers have shared so far, click here! it looks nice but I don’t like stew! Yup, sounds good, right? 🙂 Make it and enjoy! Mums are always great! What a comforting bowl of stew 🙂 Love the flavors you used here…. Will try it out soon!!! Looks delicious! what do u have it with.. rice? Not much of a stew fan, would this work as a soup if I took out the brocoli/cauliflower, replaced it with tomatoes and potatoes and blenderised it? You know, I think it would! Just omit the green chillies when blending (or only put a tiny piece to start) because while they work well slit in a stew, it may be too spicy if you blend it in a soup. Good luck!